I can't recommend this film strongly enough. Written by Kathryn Stockett, The Help is a fiction novel released in 2009. It is currently ranked number seven on The New York Times best seller list at the time of this writing and has been on the list for 41 weeks. I read and loved the book after hearing rave reviews from many friends. The book was rich with interesting characters, many of whom were developed with a rare depth that I came to care about. Some characters I loved while others I hated. When I heard they were adapting the novel into a film, I was concerned about the actor selection and how they would be able to do justice to this worthy tale. My fears were for naught as The Help brings the book to life in a way that few films do. Eugenia "Skeeter" Phelan (Emma Stone) longs to be a serious writer. After graduating from college in 1963, Skeeter returns to her home in Jackson, Mississippi and lands a job at the local newspaper answering letters regarding homemaking tips. She enlists Aibileen Clark (Viola Davis), a black maid who has spent her life cleaning white people's houses and raising their children. Over the course of working with Aibileen, Skeeter gets the idea to write a book from the perspective of maids working in her town. Eventually she is able to convince Aibileen to tell her story along with another spunky and outspoken maid Minny Jackson (Octavia Spencer). They are both scared about what will happen if anyone finds out due to the violence that is escalating over civil rights. Skeeter is able to get a well-known publisher, Elain Stein (Mary Steenburgen), interested in the novel but tells her she needs at least a dozen maids to tell their stories. Gradually they are able to get many other maids to tell their stories. The wives that are being told on are unsuspecting and oblivious. Hilly Holbrook (Bryce Dallas Howard) is the ringleader and most deplorable; she wants things to remain as they are and even champions a campaign to force the help into using their own outdoor bathrooms. Celia Foote (Jessica Chastain) is new to town and just wants to fit in. She hires Minny after Hilly fires her and treats Minny with kindness and appreciation which is something that Minny needs to adjust to. Everything comes to a head once Skeeter's novel is published and things in Jackson will never be the same. Dolby Digital 5.1 and 2.0. There are not many bonus features to speak of. "The Making of The Help: From Friendship to Film" is an informative and interesting behind-the-scenes featurette that includes interviews with Stockett, cast, and crew. "In their Own Words: A Tribute to the Maids of Mississippi" offers stories from real maids. Deleted scenes with an introduction by director Tate Taylor is another feature. None of the edited scenes add much, but it is nice to get a little more time with some of the characters. I have watched many films about the fight for civil rights, and this is a new and touching perspective. It is a rich tale that evokes many strong feelings, from horror over what occurred during that time in our country to joy in the courage of those that forced change. The ensemble cast is one of the most extraordinary ever brought together; the best part is that they are all women. To have a successful film driven by strong female performances is empowering especially in a film that is about equality. While the main actors are all incredible, the smaller roles are equally impressive. Sissy Spacek, Allison Janey ,and Cicely Tyson light up the screen, and I yearned for more time with each of them. I can't recommend this film strongly enough. This is a time in history that is important to remember. There is still much injustice in the world and perhaps this film can help inspire people to treat everyone with respect, dignity, and kindness. I will go a step further and encourage any viewer to read the book as well. As is necessary in any adaptation, there is character editing and lost details. It doesn't diminish the overall story which is why the film is so successful but reading the novel will help enhance what the viewer already knows. I will warn you though: have Kleenex handy. 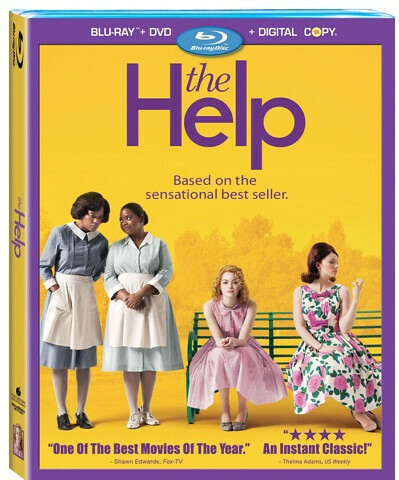 The Help is available December 6, 2011 as a Blu-ray Combo Pack, DVD, Digital Download, and On-Demand.